On the Site Analytics tab of the dashboard, select the timeframe you'd like to export for. Click Export in the upper right-hand corner of the Identifiable Sessions table. Your .csv file containing all browse and cart abandons for the selected time period will download instantly. Note: If your site is not implementing Full Site Tracking (v4), you will only download cart abandon details. On the Campaign Results tab of the dashboard, select the timeframe and the campaign for whatyou'd like to export a list of conversions. 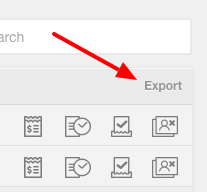 Click Export in the upper right-hand corner of the Converted Cart Details table. Your .csv file containing all conversions for the selected time period and campaign you specified will download instantly. Note: Make sure to check your browser's downloads.